A government official in the southwestern Chinese city of Dazhou has blamed foul air quality on people making smoked bacon, despite experts saying the smog comes from the usual suspects: factories and car emissions. Since the beginning of January, Dazhou in the Sichuan Province has been shrouded in heavy smog, reading PM2.5, way above acceptable level for people’s health, Xinhua news agency reports. Almost every household in the Sichuan province follows the longstanding tradition of smoking bacon before the Chinese lunar New Year, which this year falls on February 19. Meat smoking sites, much easier to blame and far quicker to demolish than factories, are now being bulldozed by zealous local officials, who are claiming they are responsible for the smog blanketing the city. Their actions have sparked a wave of public ridicule on social media and blogging sites. “Smoking bacon has a long history, but smog does not,” said one comment. According to the Bayu Public Welfare Development Center, a non-governmental environmental protection organization, smoking meat does not contribute to air pollution. “The impact of the smoking process is confined within a 50-meter radius,” one of their volunteers told the Chongqing Evening News. This isn’t the first time that bureaucrats have fumbled around for scapegoats for the appalling smog. In October, officials blamed smog in Beijing and neighboring Henan Province on farmers burning straw. At the moment Beijing is suffering air pollution at 20 times the limits recommended by the World Health Organization (WHO). According to the US Embassy in Beijing, pollution levels of the most hazardous PM2.5 particulates rose to 568 micrograms per cubic meter on Thursday. A Yellow alert, the third highest on the four-tier system, has been in force in the capital since Saturday. 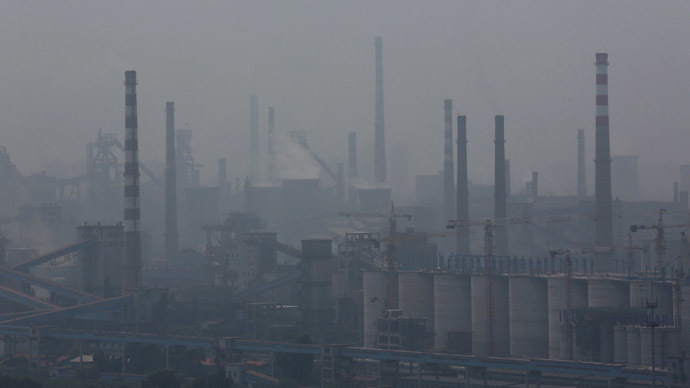 On Wednesday, the Beijing government announced that from March all construction of new oil refining, steel, cement and thermal power stations will be banned.